So this project began as many of mine do: a challenge. Back in August of 2014 (yes, it HAS been that long! 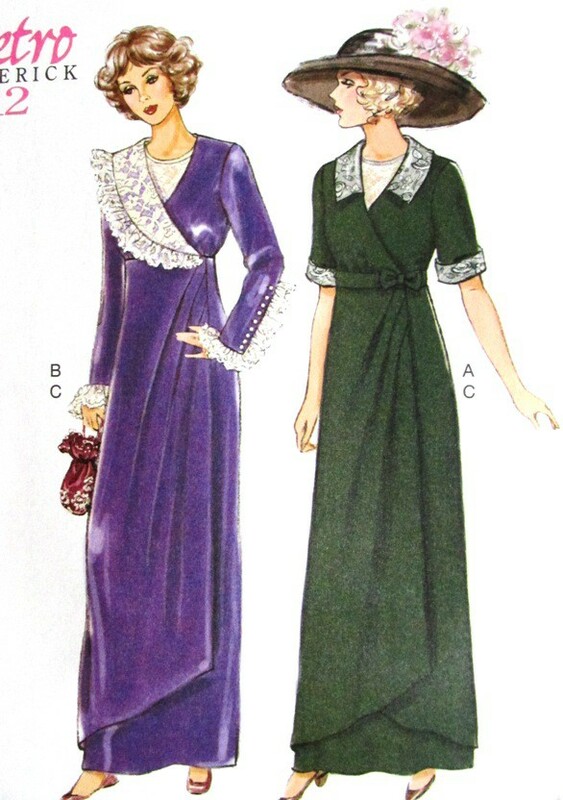 ), Butterick released two 1912 patterns in their Retro line, B6108 and B6093. I actually like the styling of this one and the coat looks very well made, but I can see how with long line paired with such gloriously wide lapels would intimidate the modern fashion palette. Again, nicely made, but the model is a bit overwhelmed by it (and the hair). Again, it’s not exactly to modern tastes. 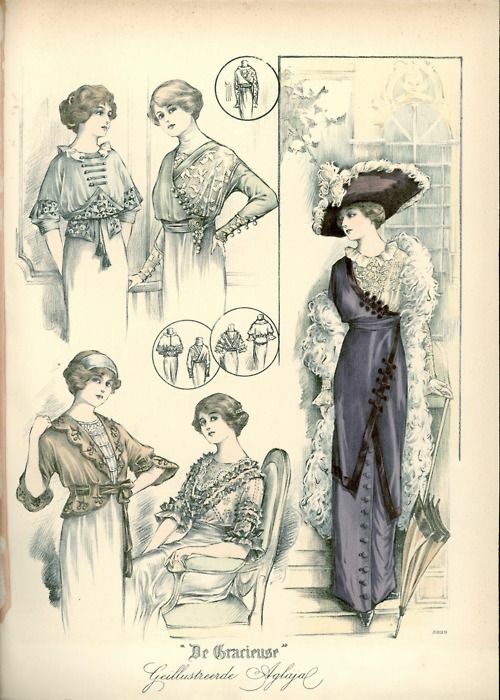 1912 isn’t exactly a fashionable year by modern standards (and that polyester lace doesn’t help matters), but to the costuming community, the patterns held potential. B6108 was instantly a favorite and while the long-sleeved example dress frightened folks at first, once people realized that B6093 had a short-sleeved, lace-less option, the patterns flew off the shelves! For a while, I couldn’t find them anywhere because they were bought up almost as quickly as craft stores put them on the shelves. However, earlier this year, I finally hit a pattern sale at the right time and snatched up a copy for myself. The cover bears the line drawing of both design options. 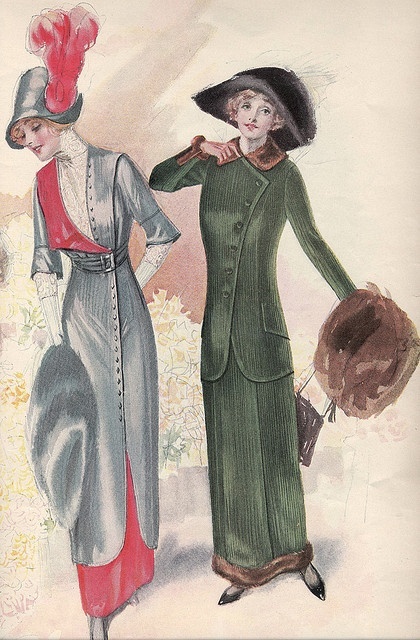 Universally preferred View A lady in green on the left appears in her large, fashionable hat while the poor line model for View B casts down her eyes as though even she knew no one liked her. 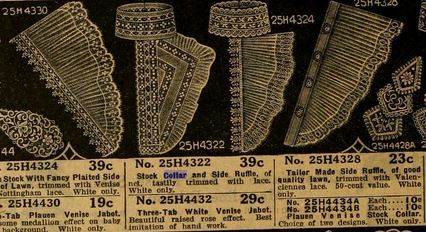 View F in this Sears Catalog ad has the same squared lace cuffs. 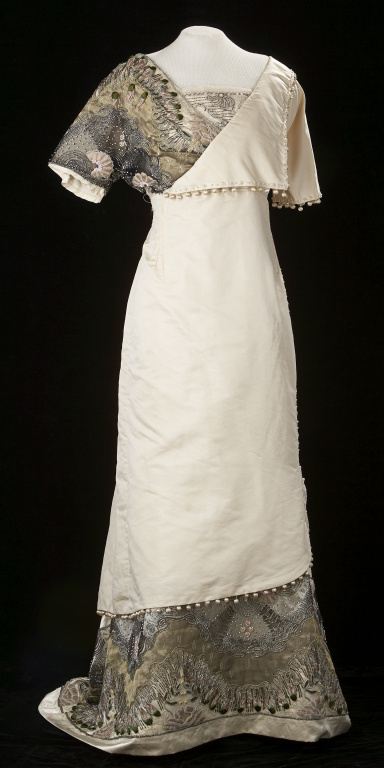 This gown is from the Glenbow Museum website which has a tendency to not hyperlink well, so I am including the item number here: C-4600. This is one of those gowns that is dangerous to wear–I might drool all over it! From a now-defunct eBay auction, sadly. But at least the image survived! I liked everything about it and it looked like a perfect candidate for transforming View A from shamed to acclaimed! Aside from the single lapel, this dress design has fan of lace that stands out from one side of the collar. Perhaps this was what the designers were trying to emulate in their design? Having an asymmetrical lace drape was popular and could be bought pre-manufactured to add to your dress. 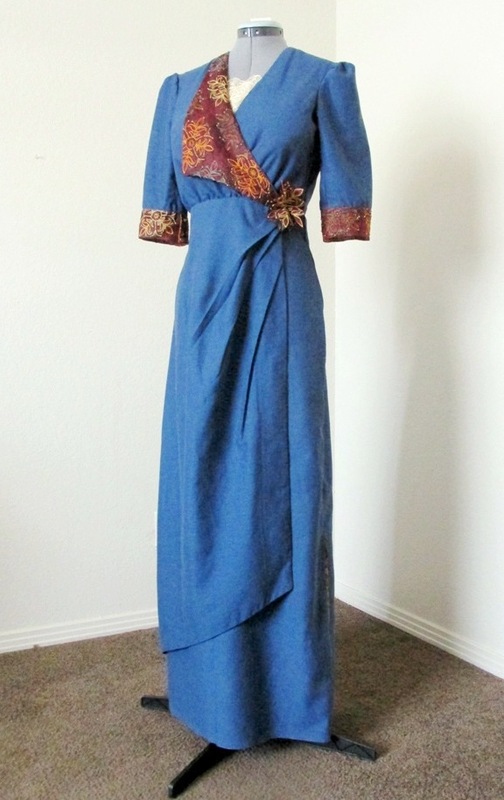 I planned to use some nice faux silk and a sari I had to make a nice dinner dress (I love dinner dresses), but I ran into a few hiccups along the way. I cut out the pattern a few months ago, but then life happened and I hit a major sewing slump. By the time I picked the project back up, I realized I’d cut the dress a size too small! This pattern really does run true-to-size, so according to my measurements, I needed a 14 or 16. I’m between sizes thanks to my large bust, so I usually cut a 14 and do a full bust adjustment. This pattern, however, is designed to fit very loosely up top, so the bust size is more flexible. I should have cut a size 14, but instead, I cut a size 12! Guess I was in Simplicity rather than Butterick mode that day. Both companies follow different sizing charts and I fit a size 12 in Simplicity patterns. Oops! So I shifted focus from making a full dress to just creating a wearable (if I lose 5-10 pounds) mockup. Using the cheap cotton sheet worked to my advantage because I didn’t worry about wasting materials and it was easy to sew. B6093 has a curved, semi-circlar collar/lapel. 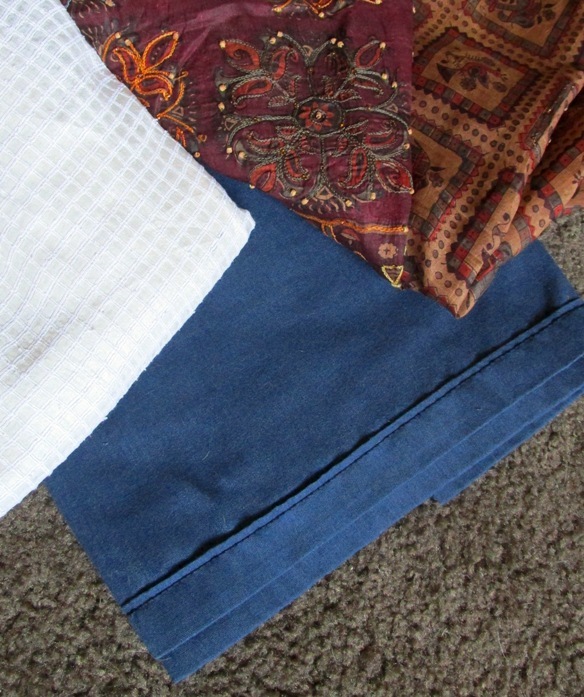 My inspiration image and most of the period fashions I found have triangular lapel shapes, so I tucked and folded the pattern tissue until I got a shape I like. 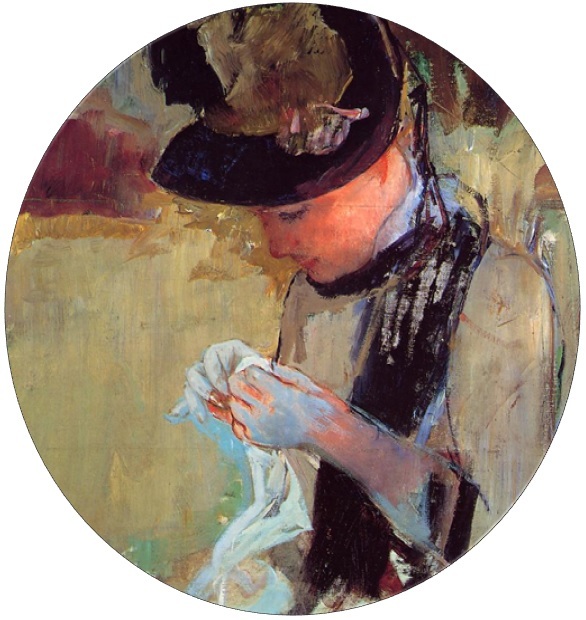 Folding the tissue rather than cutting it is a great technique because you can make alterations to this particular cutting without damaging the original pattern. That way, you (or someone else) can go back to the original design in the future. 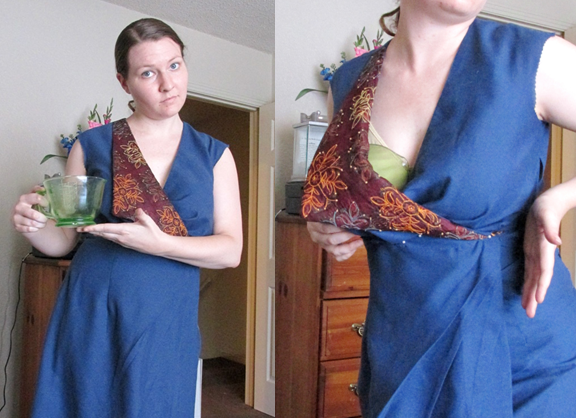 Otherwise, I pretty much made the dress directly from the pattern. I did opt to mix it up a bit and use the short sleeves from View B to match my inspiration dress, but I followed the directions pretty much to the letter. 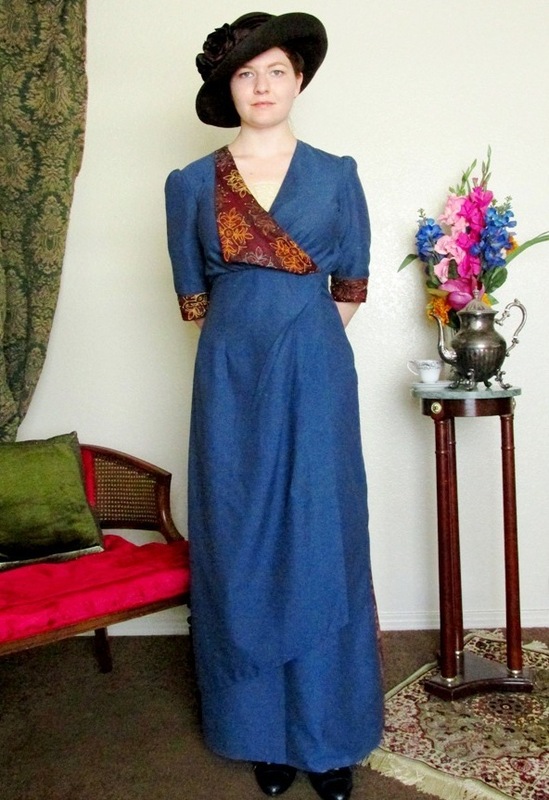 Butterick lists this pattern as an “Easy” design. Easy, to me, is something like a drawstring skirt or Simplicity’s Jiffy pattern line from the 1950s, 60s, and 70s (only 2 pattern pieces? Sign me up!). The Easy designation on this pattern is really a misnomer. While B9063 isn’t difficult, it’s definitely not Easy unless you have prior sewing experience. It has set-in sleeves, hand-tacked facing (for this mockup, I cheated and used iron on hem tape. Worked like a charm! 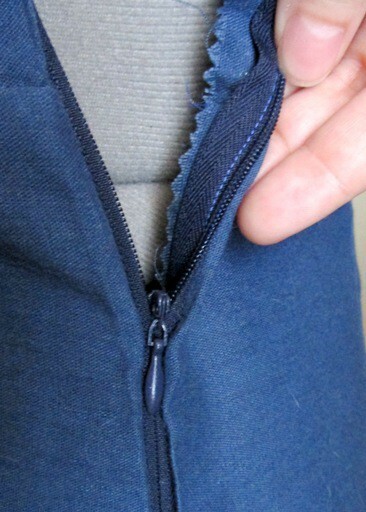 ), interfacing, lining, collars, sewn-in pleats, and an invisible side zipper all of which can be–and in my case, were–finicky. 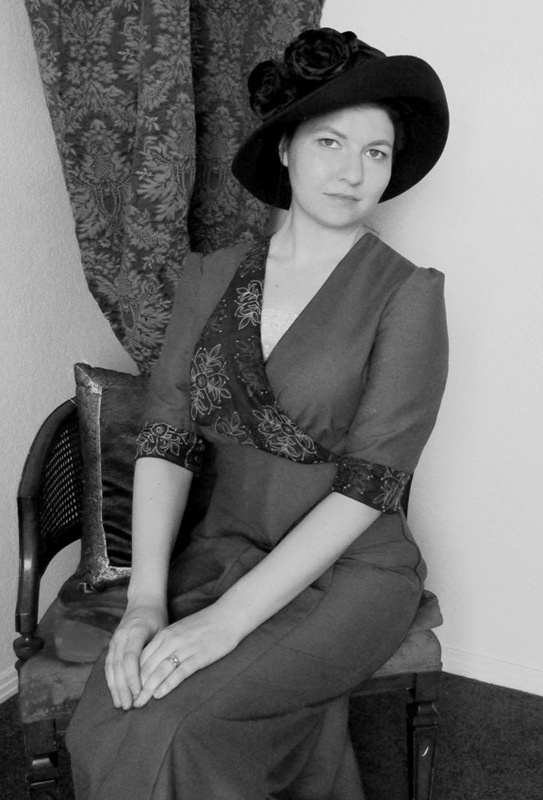 Ah, the flattering pictures I suffer for costume science! Patterns are drafted for a B cup. I have DDD/F breasts, so usually I have to do a FBA to get my girlies to fit. 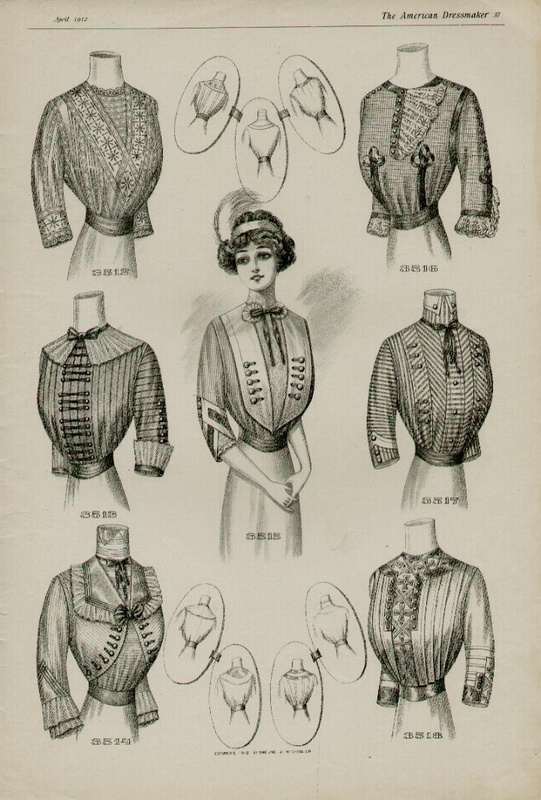 Dresses in 1912 still had fairly full tops and are meant to skim over the breasts, not fit to them. Hence, this pattern has a ton of design ease built in (over 7 inches!). 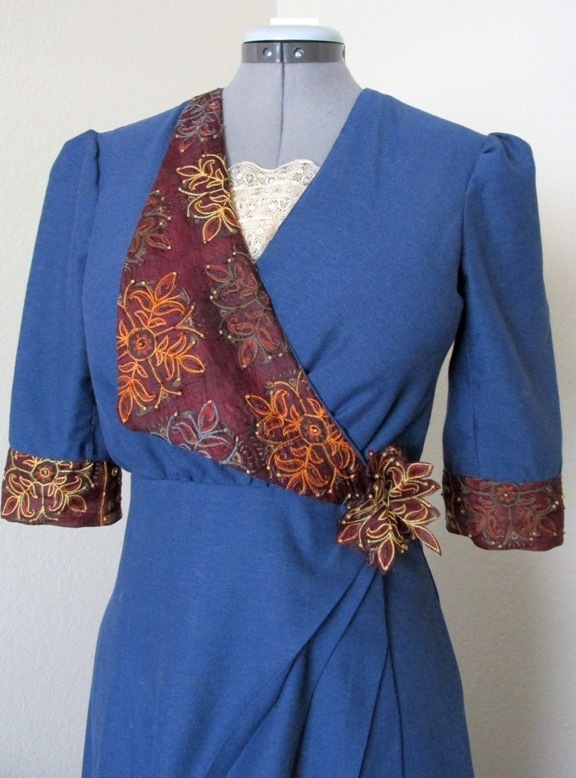 It is designed to be worn over a dickey or blouse to keep it appropriately modest, but this much gaping, even over a blouse, would be far too much! Turns out that you must fiddle with the amount of cross-over to get it to lay properly. In my case, that meant closing the V up a bit, subtracting bodice length, and fiddling with the distribution of the gathers in the front to keep my “two scoops” contained! The invisible side zipper scared me, but it turned out okay considering that I don’t own a zipper foot. Indeed, I own an invisible zipper foot–which would be just the tool for the job if it wasn’t for that fact that it was invisible because it didn’t exist. I own a very basic Singer “Simple” machine. It works great! But, it did not come with a zipper foot. It came with a button hole attachment and even a button attachment, but no zipper foot. What sort of weird logic is that? Most Easy and Beginner patterns out there require zippers, not buttons, so I don’t know why Singer chose to include button attachments with their beginner level machine. Ah, challenges! So I sewed that sucker in without a zipper foot! YEEHAW! It is definitely not invisible, but it works! A raging success, considering I just jammed it under the regular presser foot and prayed. Speaking of jamming and praying, with the help of my Rago 821 waist nipper, I was able to stuff my size 14/16 body into this size 12 dress to get few photos! 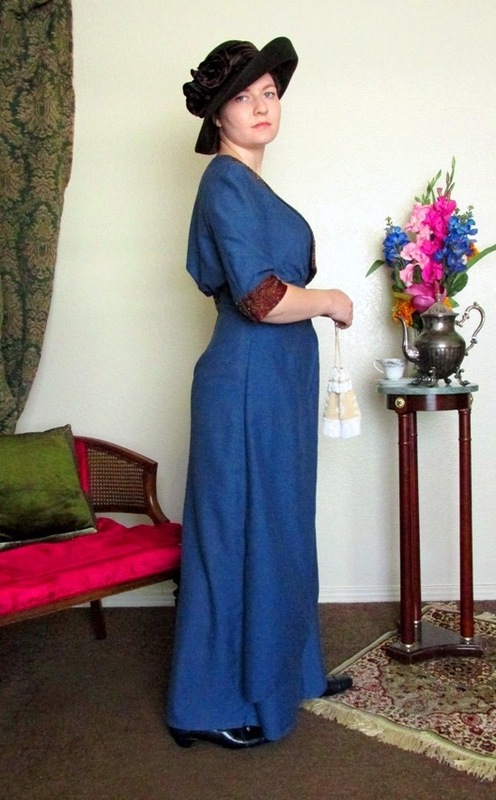 I love the 821 because it does a good job of smoothing from underbust to hips like the columnar corsets of the time did. Here, you can see how blousy the top is. If I had the B cup bust this pattern was designed for, the flounce would be for even front-to-back. 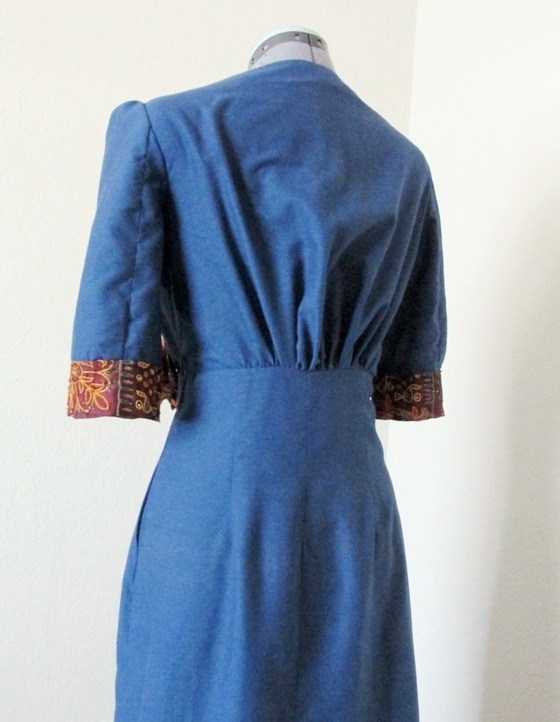 As it is, when I make a “real” dress out of this pattern, I will pleat the back rather than gather. Ah, those little sleeve crowns! They are from the sleeve head being too tall at the top. Otherwise, the silhouette is very flattering on my body type. 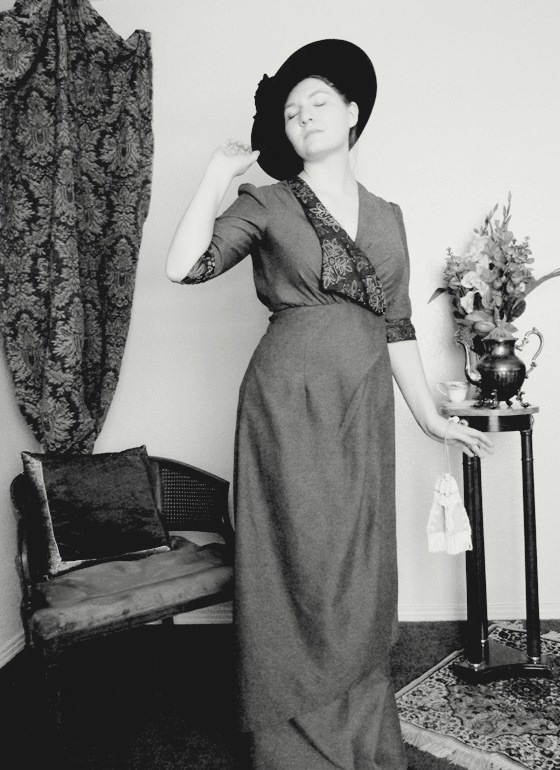 The Edwardian era is gold for inverted triangle body shapes! 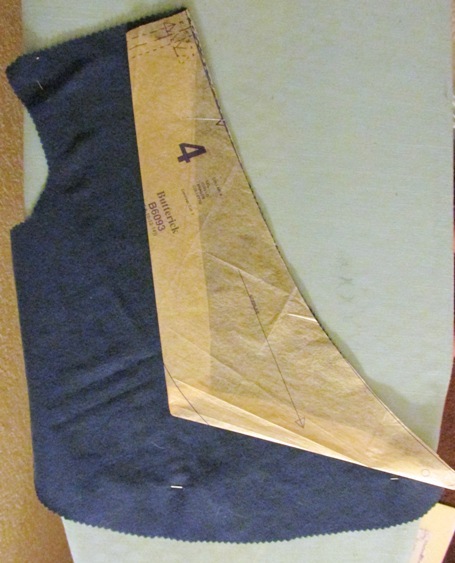 The pattern has a very long, open kick-pleat on the side seam. It’s not historically appropriate, so I just added a gore made of the sari fabric to fill it in! It’s a nice little accent piece now. Sitting in this dress was a trick. While the top is very loose, the skirt is very slim. I don’t have huge hips by any means, but the skirt was far too tight even though I have the recommended hip measurement for a size 12 (36″). If you have a large derriere or thighs, going up a size or two in the hips would be prudent! I think I did a pretty bang up job of nailing the inspiration image. I have the trim for the bottom saved if I ever lose fit into this dress and want some more pizzazz. My dress form has a longer torso than me, so the dress hangs better on it. 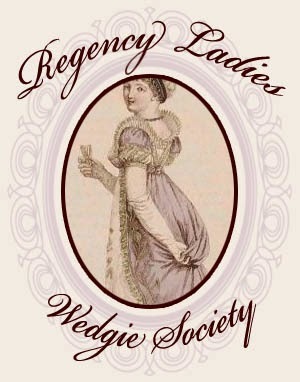 If you are short waisted, you may want to shorten the top of the skirt so the hips fall in the correct place. 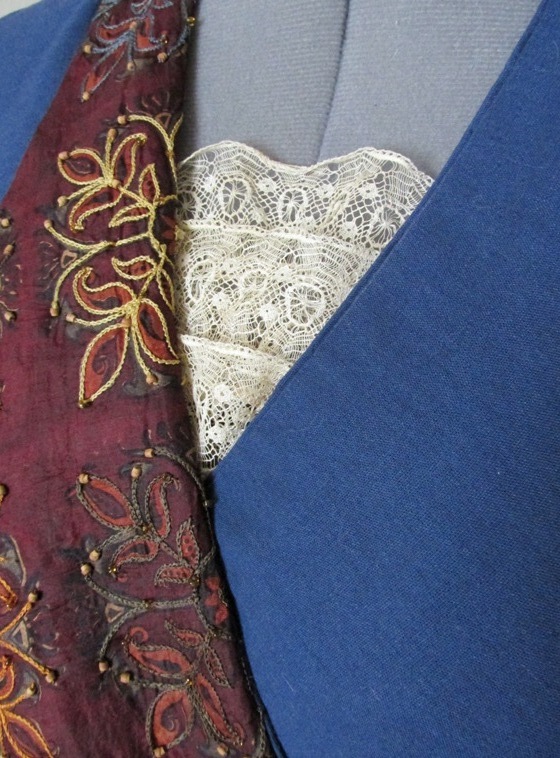 I haven’t made the dickey yet, so I tucked some antique lace into the neckline. 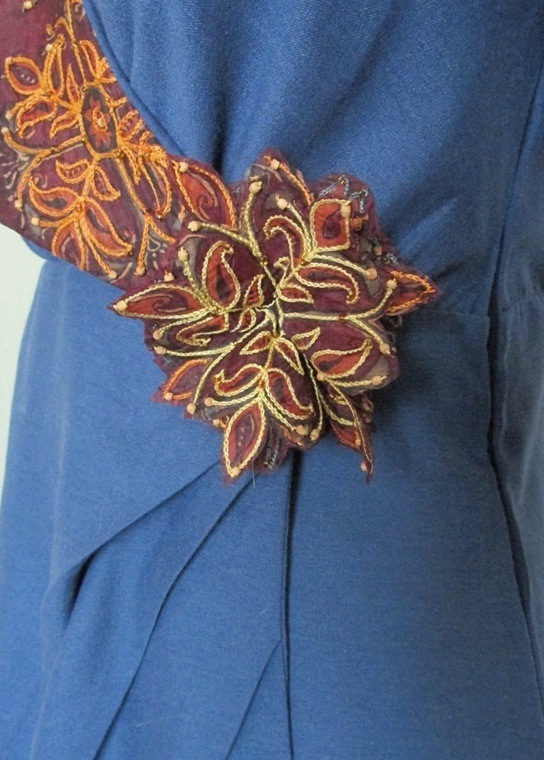 I added the little rosette from the drawing by cutting motifs from the sari scraps and mounting them on a pinback. Despite my stumbles, this pattern went together quickly. It took about a week of sewing 2 hours a day, so 14 hours? Was it Easy? No. Is it suitable for a beginner? I’d say yes. It uses basic techniques and combines them to form an interesting, pleasant-looking design. If you’ve had a bit of sewing practice and are ready for a more complex project, this is a good candidate. I am not a serious seamstress and made a lot of errors from the start, so I wouldn’t say that my experience is what you should expect. If you have the right tools (*cough* zipper foot *cough*) and pay careful attention to sizing, then this pattern will go together very nicely. I certainly like my mistake-filled mockup and look forward to fixing the mistakes in a future dress! See my latest version and updated review! Very pretty color combinations! I had the same fitting issues as you in the bodice but I have smaller girls and it was way too blousey. I had to close up more of the front too, and did away with a vest insert. And the front overskirt wasn’t wide enough to meet on the side as it should. I chose to do hooks and eyes rather than a zipper on the side. I’m out of practice doing zippers. I did the same thing as you, collecting fashion prints of the time to come up with ideas that this pattern can be used for. There’s a ton of them! This looks great! 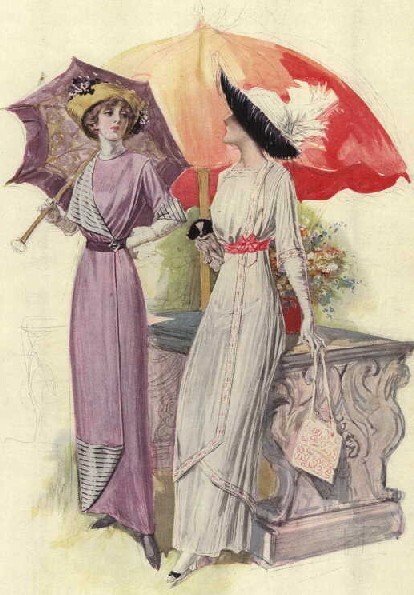 I actually really like clothes from the 1910s (at least, the more high-end designer fashions of the time were really elegant) but I can see how some people might not like them. Wish I was better at sewing so I could make some myself! Really really lovely! I have costumed 3 shows in this period, and I love it oargely because it looks so good on a variety of figures. One trick for the lap over neckline is to put cording in the bias seam, inside the facing where it meets the body, and pull it up a bit to snug the fit next to the body. 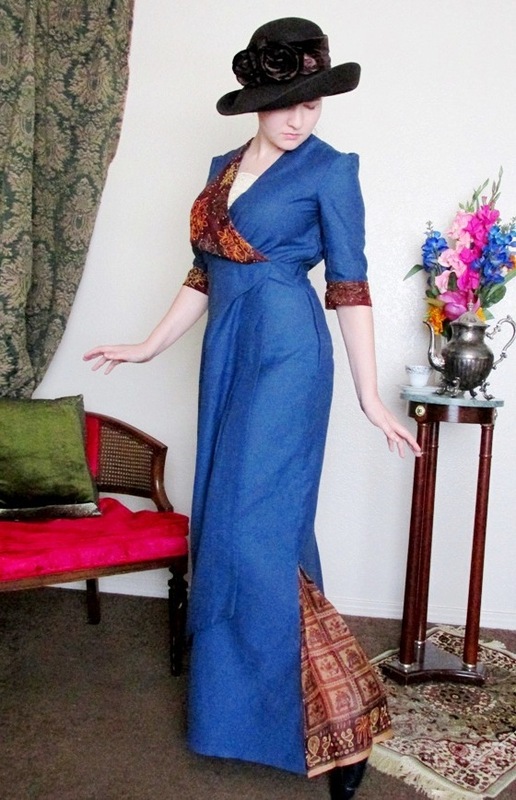 I actually like to do that with all kinds of necklines in period garments. You don’t have to pull it very much, just a little snugging. Kudoes to you for all the research! Gorgeous delineator examples. The NY Public Library also has wonderful images available. 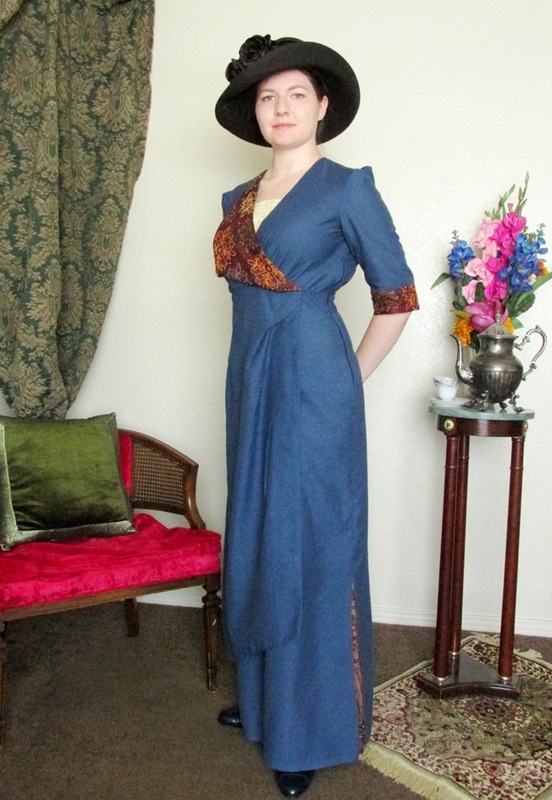 Beautiful dress – and a great post full of useful info and fun. Thank you! Again, another fantastic job and great photos. Thank you for sharing with us!! I went into this project hating the one-sided lace thing, but after seeing so many nice extant examples that use it to great effect, I now really like the idea!